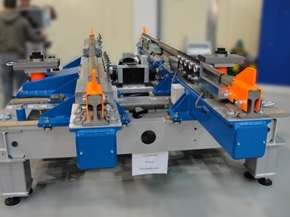 A modular and mobile bogie measurement station for heavy bogies. Bogie pressure measurement stands simulate the real forces acting through the vehicle body on the chassis. In addition to wheel contact force optimisation that supports safety and the minimisation of wear, various X and Z dimensions are inspected under load. We manufacture mobile bogie load measuring stands type BMS 09 for light bogies (trams, commuter trains and subways) and type BMS 1.4 for heavy types of bogies (coaches, locomotives, etc.). Special feature: it is from the mobile bogie test stand family, which reverses the principle of stationary test benches as the pressure load takes place from the bottom allowing a very compact design. 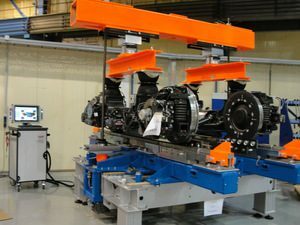 The method simulates operating loads on the bogie, which act when installed on the frame and simultaneously measures wheel vertical or axis parallelism among other things. This allows the test stand to be very cost effective. This system is flexible and makes examining bogies for various types of railway vehicles easy.